B.A.G. Brothers Donates Scientific Instruments to Central H.S. School for The Deaf, Kathmandu! On Wednesday, July 4, 2012, I had an opportunity to interact with the students of Central Higher Secondary School for The Deaf, Naxal, Kathmandu,Nepal. This opportunity was provided by B.A.G. Brothers Handicraft Center, Kathmandu, Nepal. 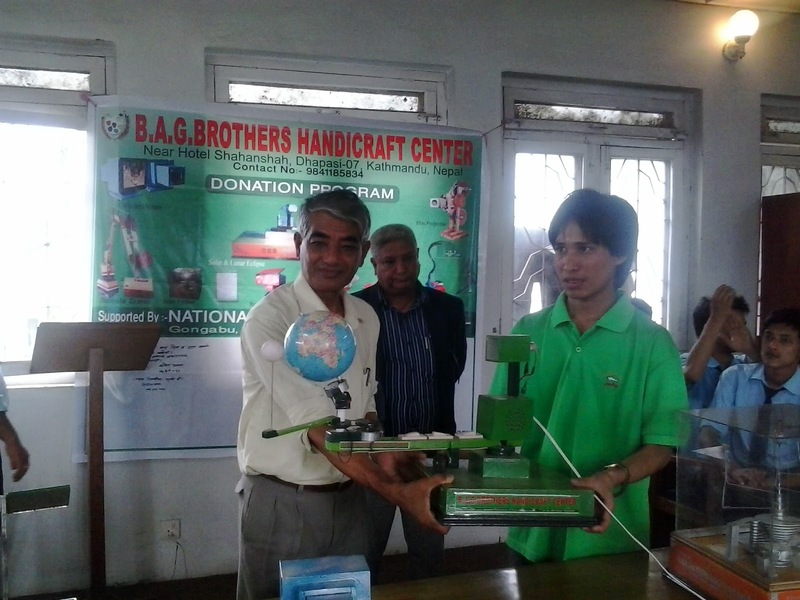 The Center had planned to donate the scientific equipments it has been producing and marketing in Nepal since 2009. The Center donated scientific equipments of worth ~50,000 NRs to the school during the donation program. Mr. Bijay Shahi donating the equipment to Mr. Narayan Bhakta Shrestha, Principal of the school. 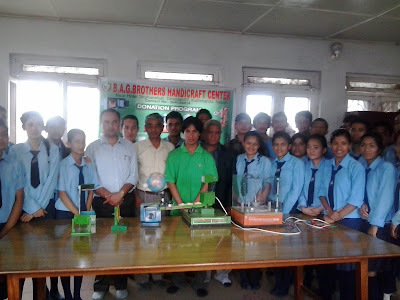 Mr. Bijay Shahi, who makes the astronomical modules, demonstrated the instruments to the students. During the program, Mr. Shahi explained that they planned to donate those sets to at least one school per year to motivate students to do science with our own materials. He also expressed that the center will gradually make its product more scientific with its accuracy with the support of Nepal Astronomical Society (NASO) and Nepal Academy of Science and technology (NAST). During the program, Mr. Ravi Raj Shahi, Director of NAMSS, stressed the importance of science education for development in Nepal. Participants of the program posing for the group photo with donated instruments. 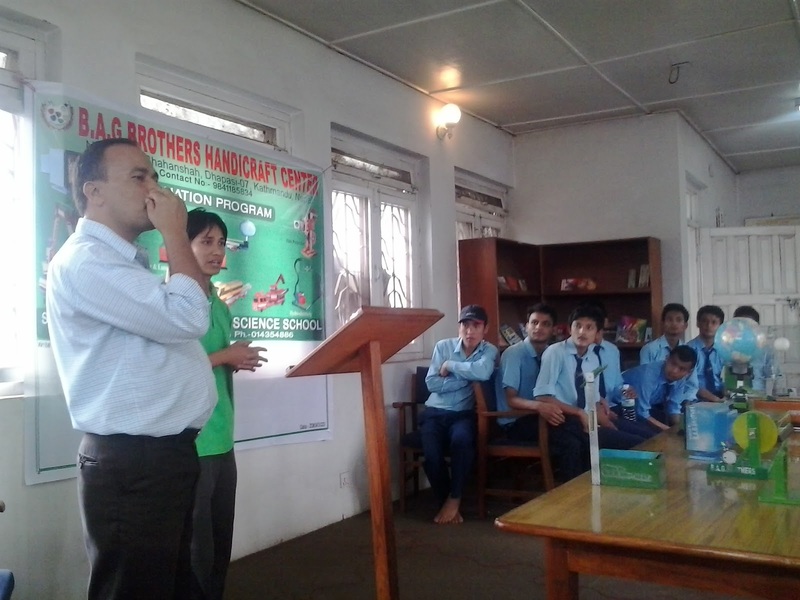 Mr. Upendra Parajuli, science teacher, converting the speecch of Bijay to sign language to the students. I was overwhelmed with the enthusiasm of the students towards science and disappointed with the lack of proper facility to them. The program was conducted on Library where I hardy found few hundred books. Mr. Nayaran Bakta Shrestha, Principal of the school highlighted that the school has been providing free education to deaf students since its establishment in Nepal (More information about the school on official site of school: http://centraldeafschool.edu.np/). NASO will soon do some programs on astronomy and space science in this school. With my observation of the school and the enthusiasm of the students, it would be great if we could start some projects which will help them to get books for their library and well equipped science lab so that you will have equal access to science education in Nepal. The School currently offers 10+2 in management and Humanities and is planning for B.Ed programs from this year as a university program. Let’s work to support these students with our supportive hands!